Catherine Dearing resigned as a director of the Idyllwild Water District last week. Catherine Dearing recently resigned from the Board of Directors for the Idyllwild Water District. President Dr. Charles Schelly confirmed her resignation and Interim General Manager Jack Hoagland said it was for health reasons. 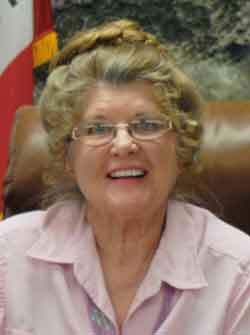 Plans for replacing her will be discussed and announced at the District’s May 16 meeting, according to Hoagland. At the IWD August 2017 meeting, the board selected Dearing as a director to replace former Director Vic Sirkin, who had resigned in July. IWD has churned through several directors since September 2016, when Jim Billman and Mike Freitas resigned. Schelly and Sirkin were selected by Riverside County 3rd District Supervisor Chuck Washington to replace them. In December 2017, the board saw John Cook and June Rockwell resign. A month later, Peter Szabadi and Geoffrey Caine were selected to replace these two. Sirkin resigned in July. Then Caine, unfortunately, developed health problems and died shortly after resigning in February 2018. Director David Hunt replaced him. The number of political appointees instead of holding elections is absurd. It’s the way of the idyllwild in crowd, sick. Good ole boy Idyllwild appointments instead of an election, that’s how the controlling elite minimize the presence of elected officials watching taxpayer money, call it efficiency err corruption.